Author statement: The author declared not having any conflict of interest. This interview is extracted from SCN News 41 – launched in May 2015. SCN News is a periodic review of developments in international nutrition to help the sharing of experience in nutrition. Learn more and download the full publication: UN SCN Website. UNSCN: The Millennium Development Goals (MDGs) will come to an end this year, in 2015. What is your evaluation of the progress made with the MDGs? From your perspective, did having such targets make a difference? If yes, could you give examples? If no, why not? Muyama: Uganda has made progress towards the achievement of the MDGs, most notably has been the progress on halving the proportion of people below the national poverty line, which was achieved before the 2015 deadline. There has also been a substantial reduction in hunger and undernutrition, but the levels of stunting are still unacceptable, with 33% of the children still stunted, according to the Uganda Demographic and Health Survey (DHS) in 2012. Primary school completion rate increased greatly, but there are still major concerns regarding education quality and poor learning outcomes, even though literacy is gradually improving. Despite significant health improvements, child and maternal deaths from preventable causes still remains a big challenge, with many deaths occurring before the child’s fifth birthday. But yes, I believe that having the MDGs made a difference, as they have been an important implementation and monitoring tool at country level. UNSCN: Do you think the post-2015 development agenda and the Sustainable Development Goals (SDGs) will effectively improve the health, well-being and prospects of the groups you represent? If yes, how? If no, why not? Muyama: Yes. The SDGs will go a step further to improve the health of the communities than the MDGs did, as they have been developed considering the challenges identified during the MDGs, for example those that arose from lack of the community voice. Community voices have been better expressed in the process of the SDGs. UNSCN: What opportunities do you see for the SDGs to improve nutrition, particularly in the 1000 days between a woman’s pregnancy and her child’s second birthday? What issues do you think the SDGs must not leave out? proportion of the population below a minimum level of dietary energy consumption. UNSCN: What is the best way to ensure that nutrition security is well-embedded in the SDGs goals and targets? Muyama: Ensure that there are specific indicators on nutrition security clearly outlined, to make the goals measurable. It also important that those indicators take into consideration different fragile contexts in the communities. This can be done by sustaining engagement between negotiators and communities. The negotiators should be given the relevant information and the evidence to ensure nutrition security remains key on their agenda. UNSCN: In September, all countries including yours will decide on the new post-2015 development agenda. Are you aware about the position your country is taking regarding the post-2015 and the SDGs? Do you feel you have a say in this? 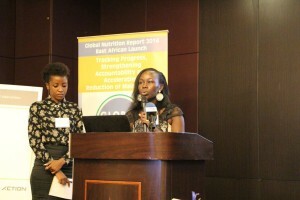 What can civil society do to ensure that nutrition is a priority for your country in the post- 2015 negotiations? Muyama: Uganda does not have a position on post-2015 and is subscribing to the broader African position. But we have been engaged since 2012. As a coalition, UCCO-SUN has contributed to these ideas right from the grassroots and up to the regional level. This has included collection of community voices that lead to the development of the Uganda civil society position paper. We have also launched the Action 2015 campaign in Uganda, and there are ongoing consultations with government negotiators on the key issues that need to be prioritized during the process of development of targets and indicators. As civil society, we need to generate sufficient evidence about nutrition and the dire consequences malnutrition has to Uganda now and in the future. We have to engage the negotiators from Uganda so that nutrition is part of the national negotiation and is key on the Ugandan Government agenda during intergovernmental negotiation processes. UNSCN: What do you think is necessary to ensure that the SDGs are implemented to the fullest? Muyama: There should be political commitment and will from the different government sectors, to support and fully implement the SDGs. All stakeholders need to play their role in the process of implementation, and there should be a robust process of creating awareness so that everybody is aware or their roles and responsibilities. Finally, country-specific monitoring and accountability frameworks for the SDGs should be established. Muyama Christine is the Coordinator of the Uganda Civil Society Coalition on Scaling up Nutrition (UCCO-SUN). She also represents UCCO-SUN in various nutrition task forces at the national and international levels. Christine is a trained Nutritionist and holds a BSc in Human Nutrition and Dietetics. Special thanks to Maria Akello for conducting this interview.